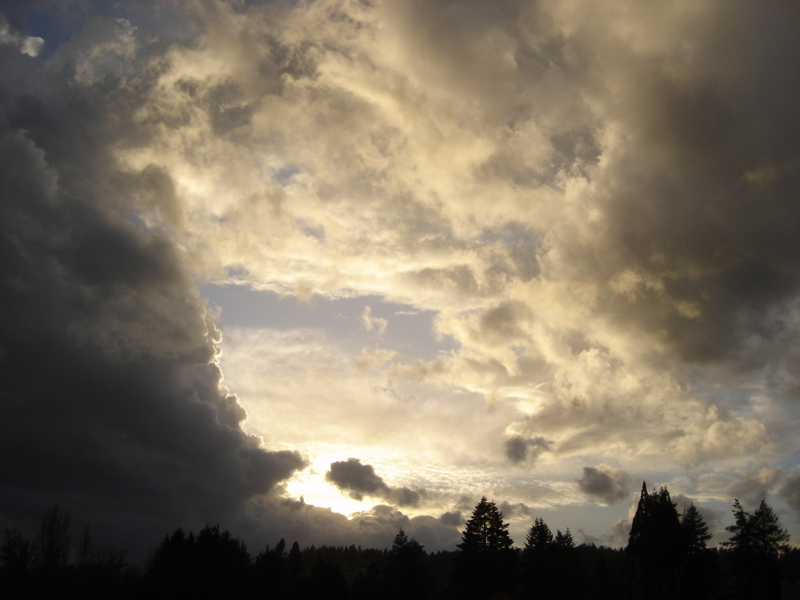 Our feature photo this month is of a particularly interesting sunset cloudscape from November 27th. I was captivated by the sense of depth, texture and mood presented on this particular evening. 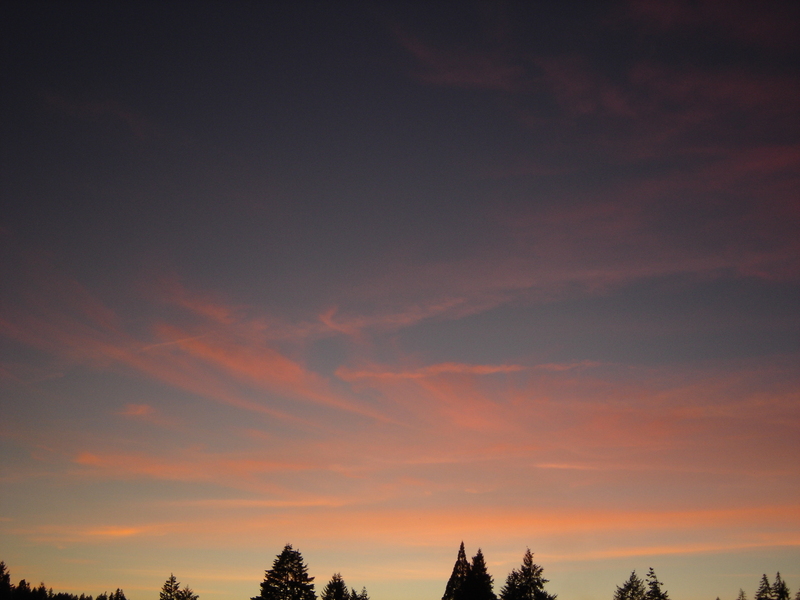 Sunset clouds on November 27th. Each day is unique, quietly revealing ephemeral treasures to those who take the time to look for them. 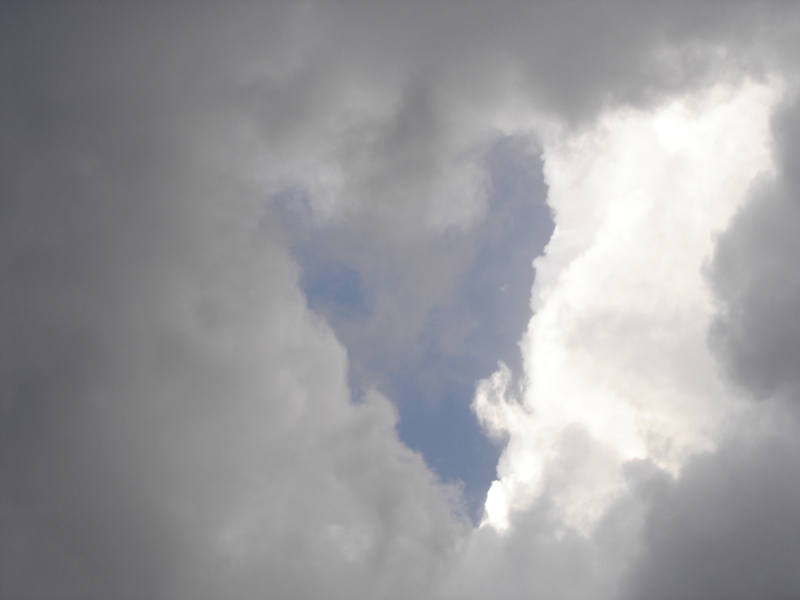 Heart of blue amid stormy skies. 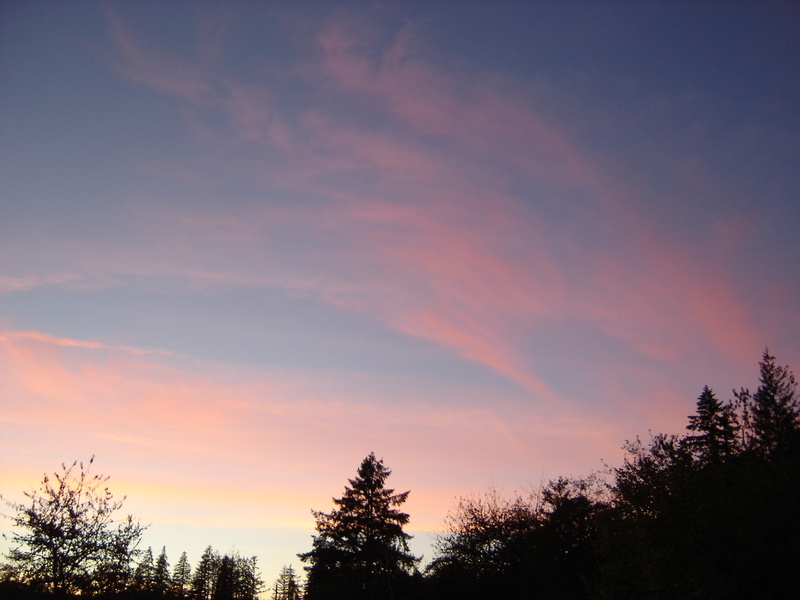 The transition into night is a time for reflection as the day comes to an end; the purple veil in the east rises earlier and earlier as the season progresses. Our November moon is waning, just past last quarter, rising later each evening. She is a beacon for all who wander about in the darkness, observing the heavens. We will not see her tonight due to heavy cloud cover and rain. Night draws closer as the sun drops further below the horizon. 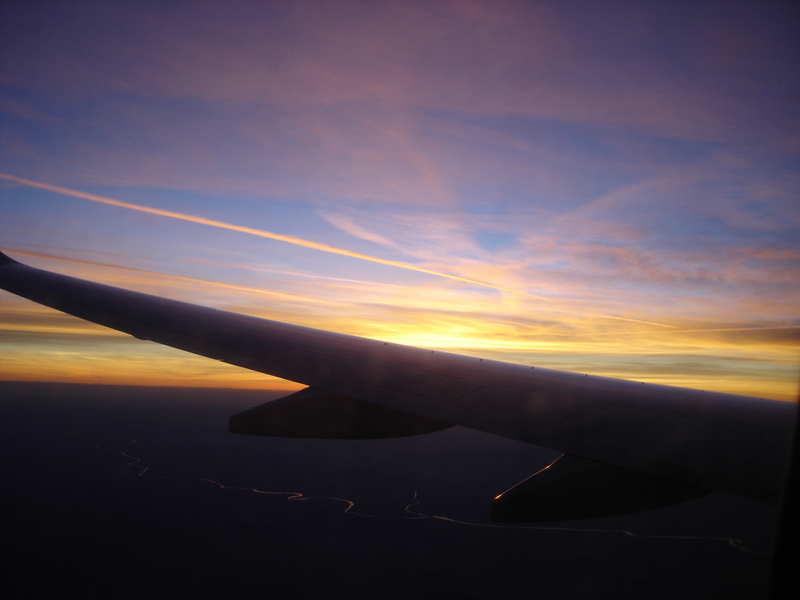 Early morning is a beautiful, contemplative time of day; silver-grey mists form and rise, taking the sunrise colors of pink and gold, and finally stark white when the sun has climbed well above the horizon. They will quickly drift away as cloud. 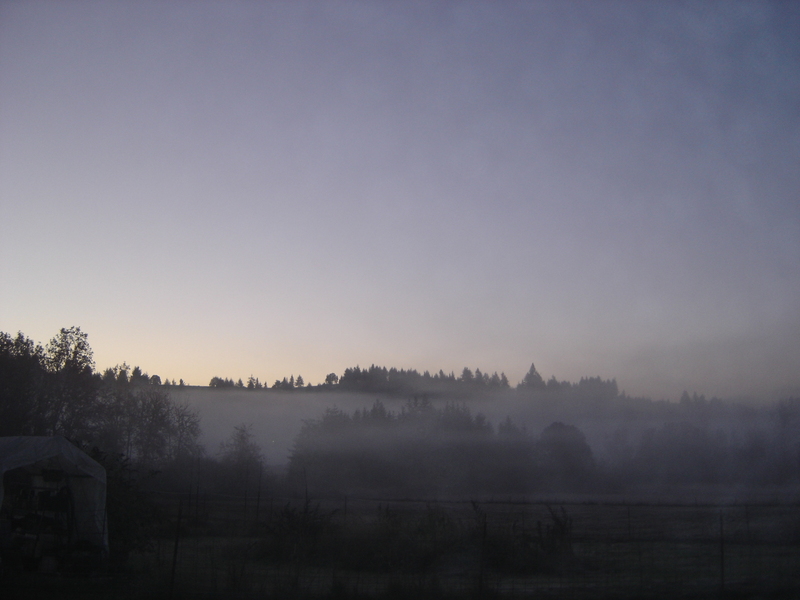 It is the time of year when the farm may stand enshrouded in heavy fog all day, with no sign, no hint of the blue river above the soft, quiet coverlet of mist and low cloud. Occasional pockets of cold air moving at ground level brush against my face and arms as they wander across the farm, like the touch of passing ghosts, sentient and otherworldly. 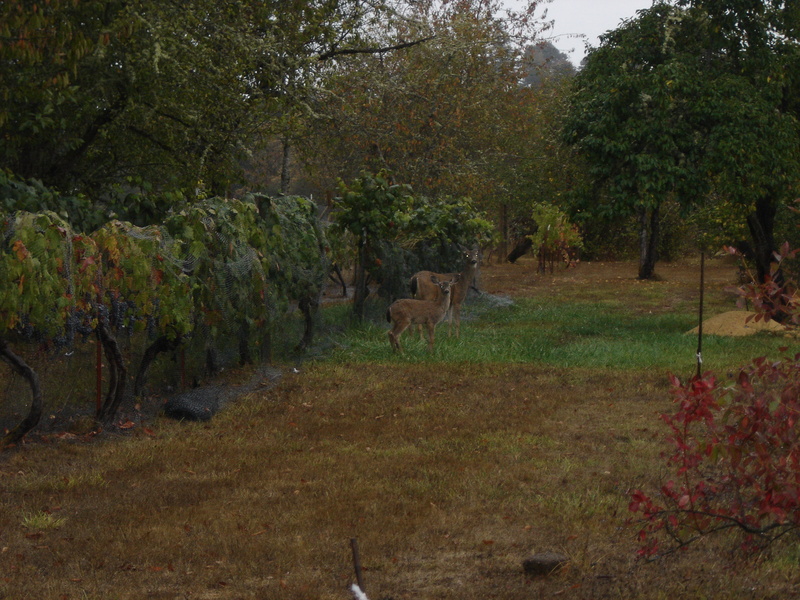 A doe and her offspring grazing along the row of table grapes back in October. Click on any photo in this post to enlarge. The months of October and November marched on through the farm in the yearly parade of seasonal produce, changing colors, turbulent skies, windstorms, falling leaves and deer in search of greenery. Jack Frost, herald of Old Man Winter, has come by on clear nights with his silver brush, leaving a trail of both scintillating sunlit morning beauty and destruction in his wake. 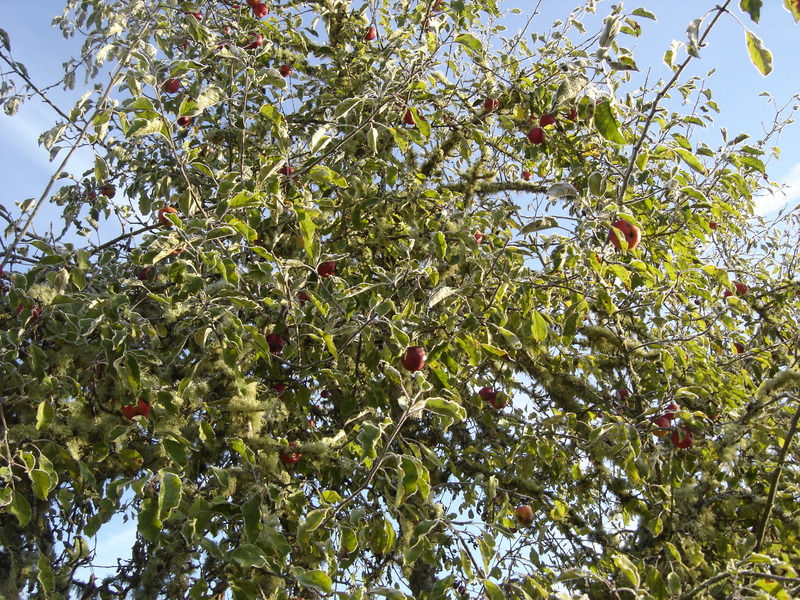 The persimmon tree, and some types of apples, welcome his return with sweeter fruit after a good frosting. Lovage growing in a half barrel sports a light covering of frost. 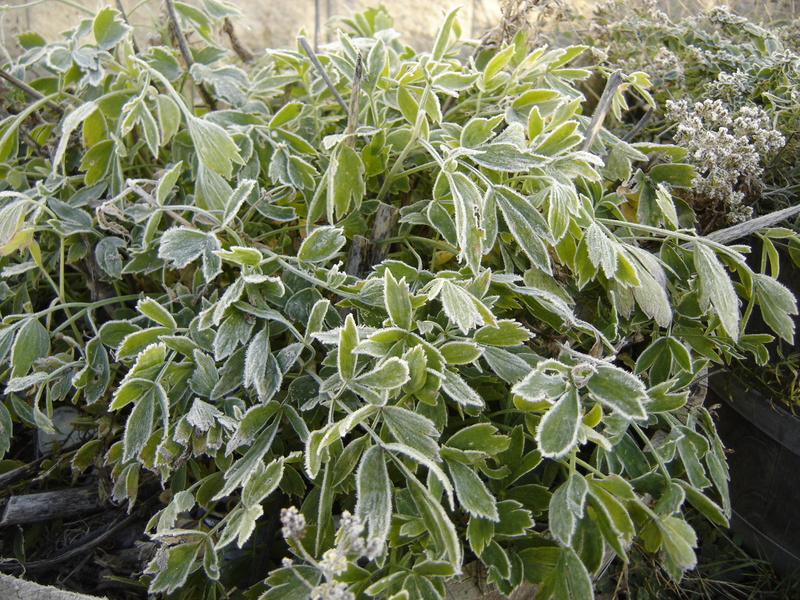 The lovage clump did not appreciate Jack Frost’s visit. Our beautiful old persimmon tree, festooned with fruit and colorful leaves. Apples on a frosty morning. Most leaves except for the marcescent have fallen, and have been raked up and placed in garden beds to help build the soil. The last roses of the season have bloomed; I lost a dear relative to extreme old age; the eldest of our cats now lives on borrowed time, the endless cycle of life of which all of us are a part. We all have our time. It has been a bitter-sweet season, and when darkness falls, I find myself thinking of a Maori evening prayer I learned from a friend in New Zealand. Safe and warm inside, the Christmas cactus enters its bloom cycle again. 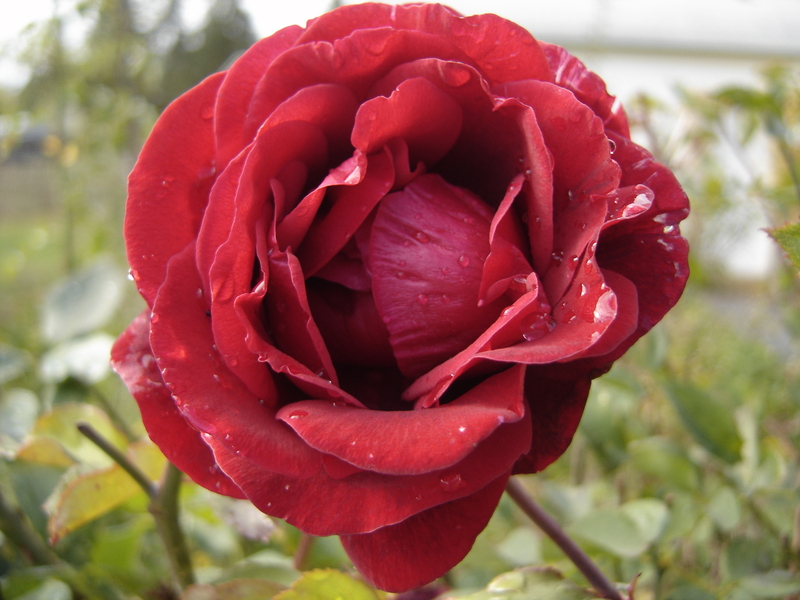 Outside, a lone red rosebud which never opened remains tightly folded against the cold. Ross were still vibrant and blooming in late October. Rosé wine from our own pinot noir is still cold stabilizing on the lees; samples were taken for evaluation today. I processed and fermented two batches of our best pinot noir grapes, selected and harvested by Rick, within a week of each other. Epernay 2 yeast (Red Star Cotes des Blanc) was used for its characteristics, as was done the previous year. Rick found both samples acceptable, they will be bottled soon. 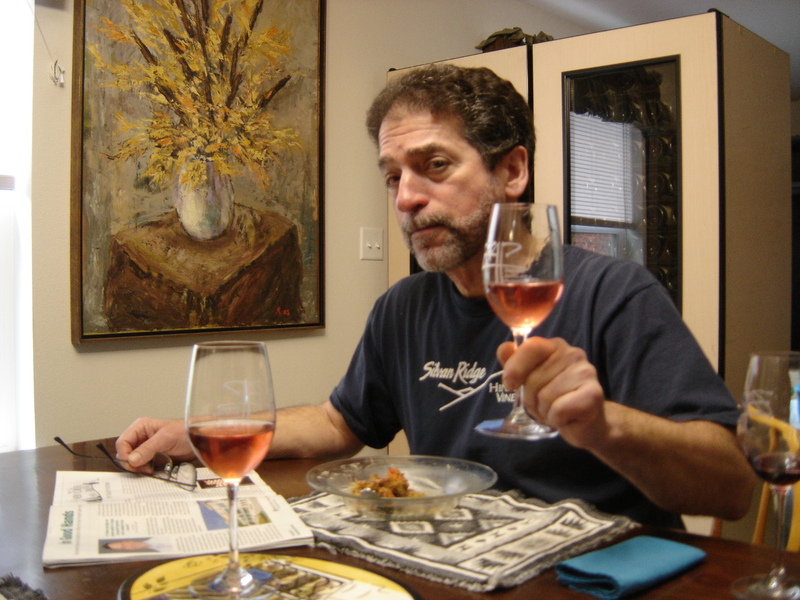 Rick, hard at work evaluating the new rosé wine with food. Mr. Nano contacted the Sicilian Feline Correspondents Desk for this month’s report, as old Willow is seriously under the weather and receiving much attention. Her kidneys are failing, and she is currently on subcutaneous fluids. For readers familiar with the BBC/ PBS series Poldark, Mr Nano is of the opinion Willow would have made a most fitting old Aunt Agatha Poldark, as played by Caroline Blakiston. One a geriatric feline, the other a fictional human, both are beloved to those who understand and appreciate their unique spirits. 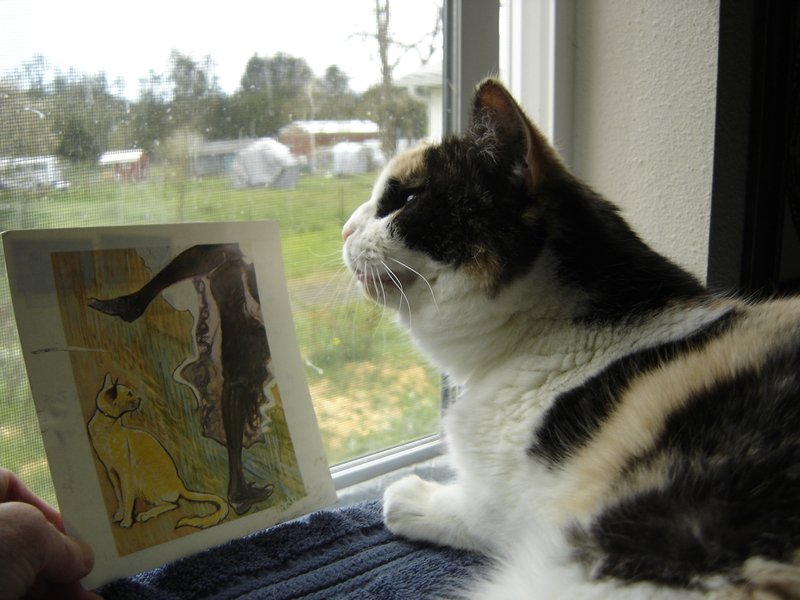 Willow in earlier times, reading a card from her friends Doug (human), Dougy (cat) and Andy(cat). Willow is not well these days. Without further ado, Sicilian feline correspondent Lucky and his fellow correspondents from the olive farm present their findings on life in the Sicilian countryside. Readers may note from previous posts that Lucky is blind, and although his acute hearing, exceptional navigational abilities and sense of olfaction are invaluable to his reports, his fellow correspondents have provided all the visual descriptions. Olive farmers and photographers M. and J. have kindly provided the photos of their farm in Sicily used in Lucky’s report. Autumn arrived, bringing more rain than is seen in a normal year for our region. Between August and October, almost a year’s worth of rain fell, making tilling the ground and harvesting olives extremely difficult. Fortunately, we did not have to harvest olives this year. The previous year, a bountiful harvest gave us enough oil to last two years, allowing one time enjoy reading and strolling through garden and olive grove. 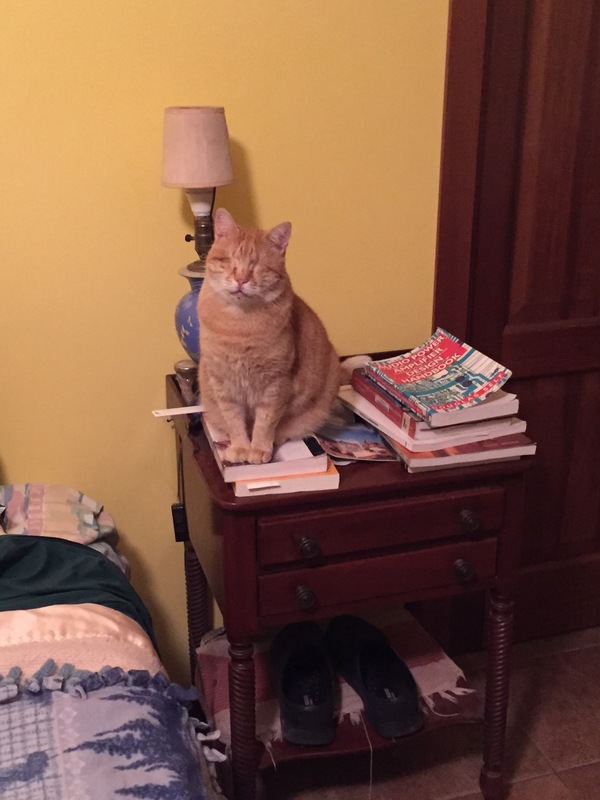 Although Lucky is now blind, he understands the value of reading. Photo credit M.G. While making my daily rounds, I happened upon a visitor lurking in the lavender, an Acherontia atropos, more commonly known as a subspecies of the Death’s head hawkmoth. As an adult it is commonly identified by the vaguely skull-shaped pattern adorning the thorax. 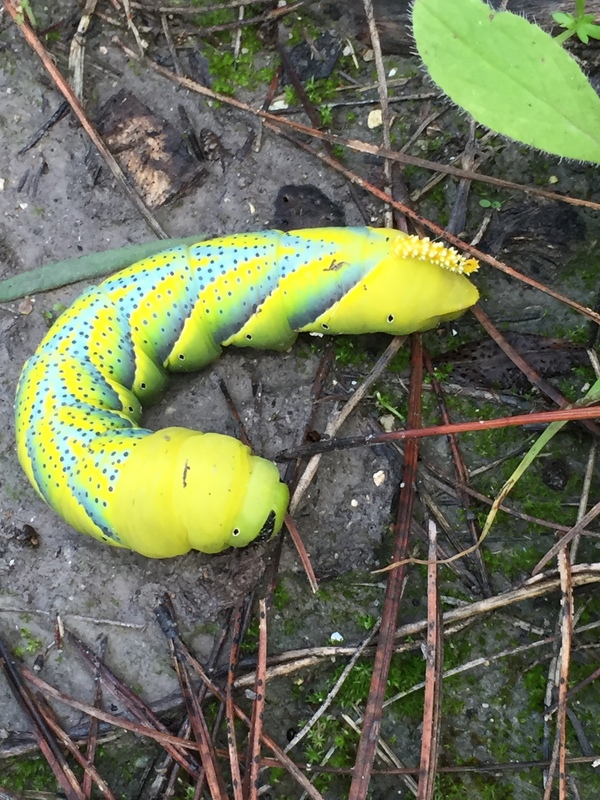 A hawk moth caterpillar. Photo credit M.G. 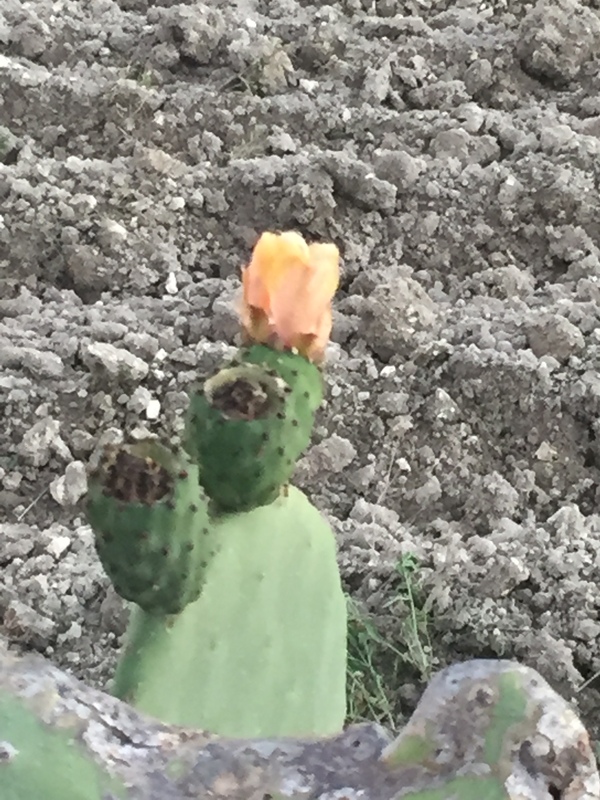 Due to unusual weather, a prickly pear plant with a flower, opuntus fica-indica, was found near others bearing their fall fruit. Prickly pear cactus in flower. Photo credit M.G. Prickly pear with fruit. Photo credit M.G. The array of autumn colors was stunning. 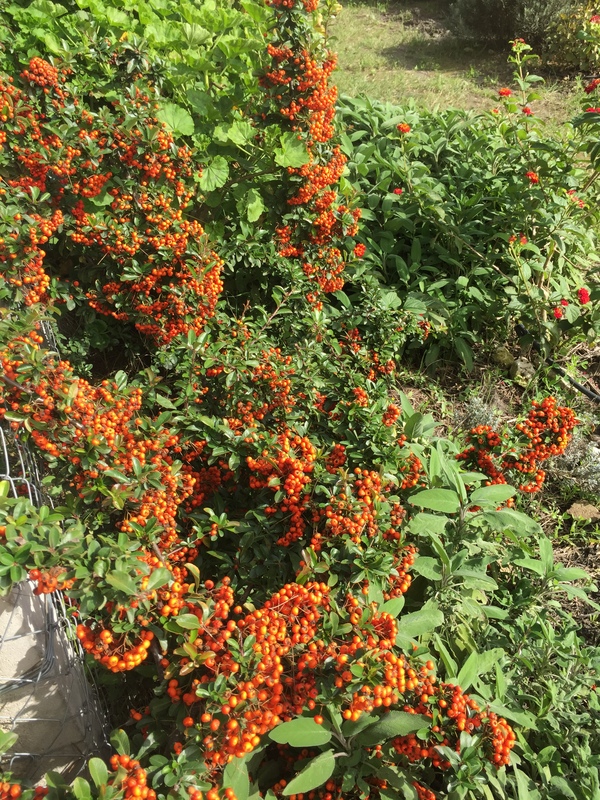 Fiery pyracantha presented its bright orange berries while the Lantana burst with red flowers. 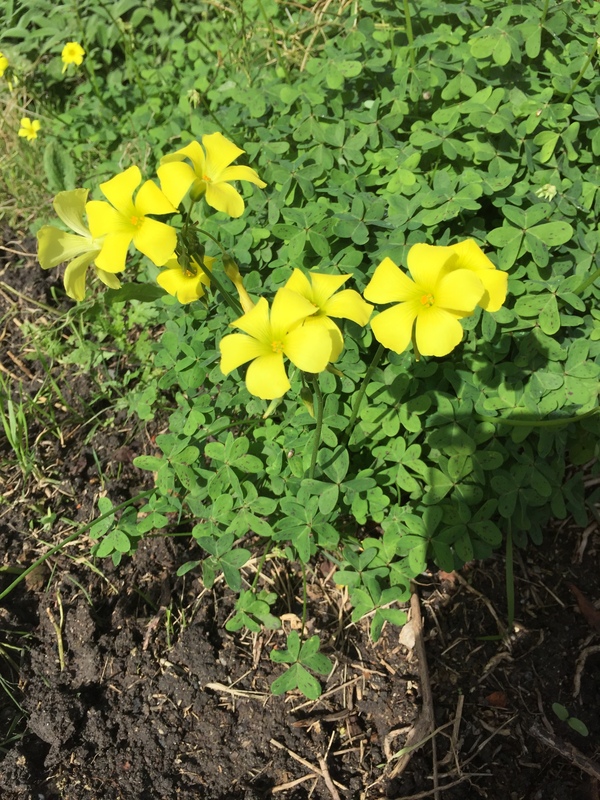 Fall irises and golden oxalis were nestled in along the path while wild mushrooms were discovered scattered throughout the field, much to my delight. 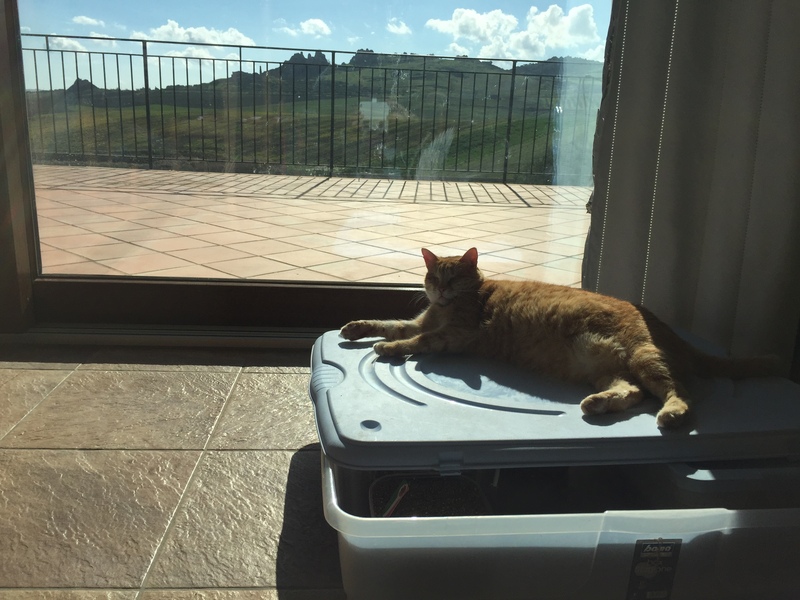 Correspondent Lucky, at home in Sicily. 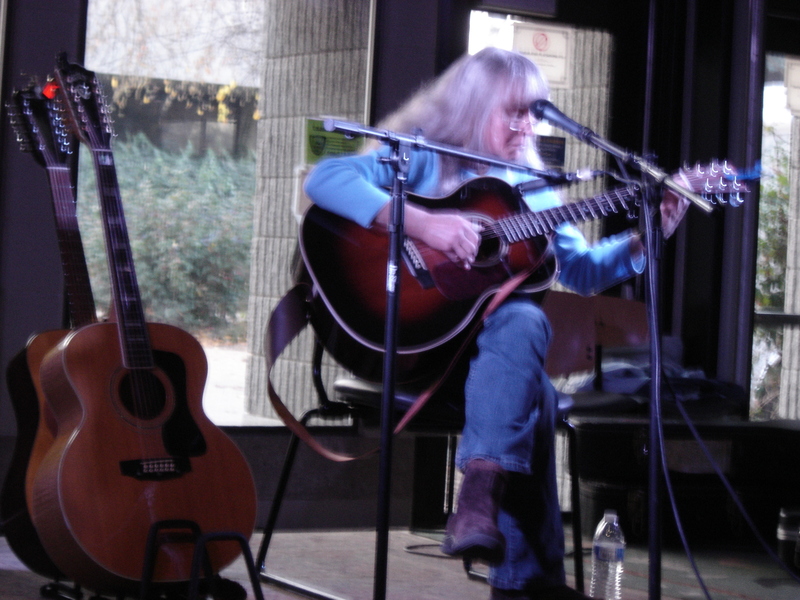 I was privileged to be accepted into the Spokane Fall Folk Festival again this year. Once again, we saddled up a trusty vehicle and made the trip up over the Cascades, through eastern Oregon and on to Spokane in eastern Washington. We stopped to eat at the Black Bear Diner, our favorite breakfast place. 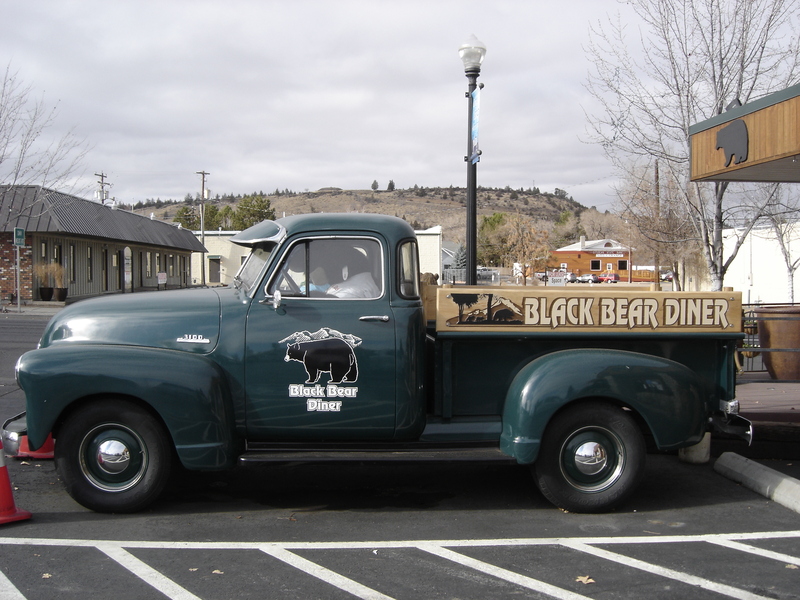 The Black Bear Diner in Madras, Oregon. The bear is still driving the truck. I was pleased to have a good set, superb sound engineers and an appreciative audience. It was all I could have asked for at the festival. A blurry photo as the flash was unfortunately off, and the hand of the photographer unsteady as my own. Photos of all the performers can be found on the festival’s site. Cherish the days. They pass all too quickly. That Sicilian hawk moth caterpillar was very impressive! As is the opening photo. Painter John Constable-worthy! Thank you so much for stopping by, Lyn! It is always good to see you, and it is time to have tea together again. I took a look at the sky and ran out with the camera. Some scenes are striking! Nature puts on a lovely show; no two are the same. The hawk moth caterpillar was an impressive little fellow! Readers, here is a link to landscape painter John Constable. It looks like you’re having a beautiful fall. I’m sorry for the losses that have come your way and I can see how that Maori prayer would be comforting. It’s quite beautiful. As for the caterpillar! What an astonishing creature! It looked like a bath toy–those colors. Hope the wine turns out well! Always good to see you, Arlingwoman! Thank you for stopping by from Arlingwords, and for the kind comments. The changes, workload and losses this year have been rather weighty. That Maori prayer is very beautiful, and a comfort. I am grateful to Gallivanta for posting that. You are right, the caterpillar does look like a bath or pool toy. 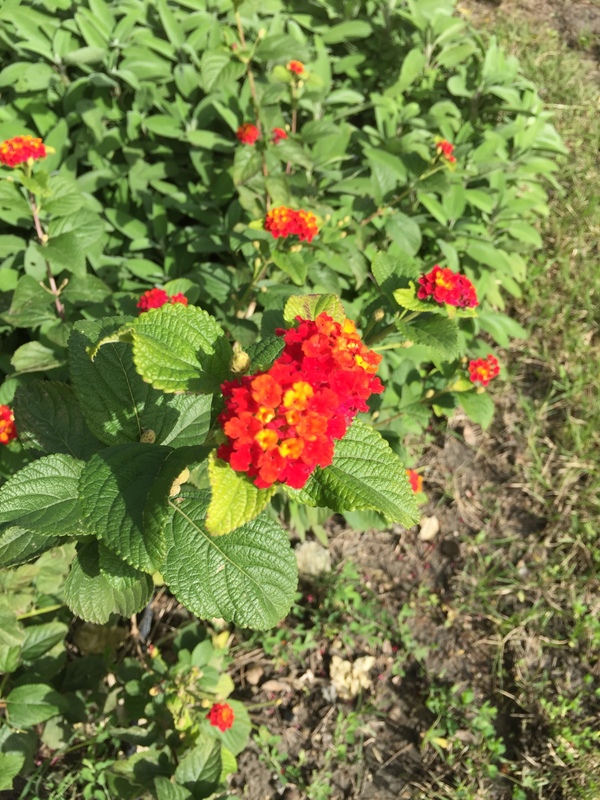 Nature comes up with some unique color schemes! Readers, Maureen Sudlow is a published author, poet and artist. Please visit her site to learn more about her work. Always good to see you, Leah! Thank you for stopping by from Catwoods Porch Party, and for the kind comments. It’s been a hard year for many. I know you miss your kitty Ultraviolet. Willow is doing better tonight, but as you know, CRF is a roller coaster ride. She will be on fluids now until the end. She is still very alert, and gets around. Now that she has the fluids again she is back to eating, drinking and vocalizing. She lost a lot of weight in the form of muscle mass. At 22 years old, she is doing the best she can. Wishing you and you family, and new kitty Franklin all the best from all of us here. great cloud photos. Frosty mornings. We are below freezing in the teens and twenties every morning now. 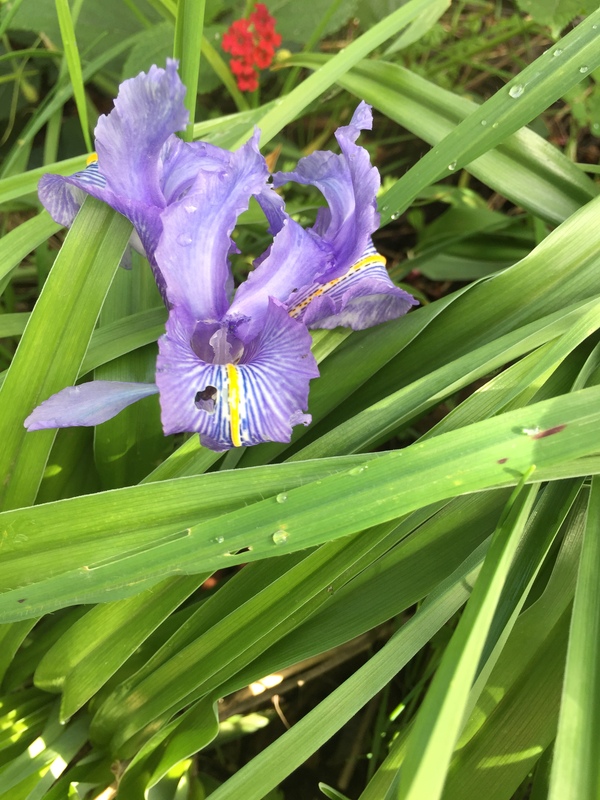 That’s a great photo of a hawk moth caterpillar, and lovely flowers from your Italian correspondent. Sounds like a really nice music festival. We used to perform at music festivals when Laurie, Tristan and I had our flamenco group. Speaking of good sound, at one festival we performed between bands. I had my own sound equipment to mic the guitar and floor, but the sound guy for the festival offered to mic me on guitar and our portable dance floor. I think we wanted to mess with a different way of setting up mics. Holy cow did he do a great job and everything sounded fantastic. I’v put nails on my right hand and have been playing my flamenco guitar. I’m having to relearn to play because the strings feel really weird with numb fingers. I am always glad to see you stop by, Tim, and very, very happy to hear you are playing flamenco guitar again! I know you will work around the numb fingers and sound as good as you ever did. I wish I could have been around back then to see the three of you perform! Good to hear you had a great sound man at that festival. It really makes all the difference. M & J live in a beautiful area of Sicily. They make some great olive oil, too! They used to live here, and moved back over there to be near family. Next week we should start seeing nights down in the 20s up here, and sunny days in the 40s. I’ve got the broccoli under mini greenhouses which are now tied down and weighted since the last windstorm. I think they will make it. Readers, please visit Tim and Laurie’s photo blog Off Center & Not Even @ T&L Photos . It is well worth the visit! Yes, the days do pass too quickly. I’m glad to see that you have had a good fall and are doing well, but sorry about Willow! Always good to see you, Montucky! Thanks for stopping by from Montana Outdoors, and for the kind comments. This autumn has gone by in a blur. Old Willow cat is doing better tonight, but at 22 years old, she is doing as best as she can. She will be on subcutaneous fluids through the end of her life. She is the second elderly CRF cat I have tended. It is a roller coaster ride through the end. Beautiful post, Lavinia. You’re photographs are amazing! Thank you for stopping by from Jill Weatherholt, and thank you so much for the kind comments! Readers, please visit author Jill Weatherholt at her blog site. She writes stories of love, faith and happy endings while enjoying the journey. Thank you for stopping by from Platform Number 4, Becky, and thank you so much for the kind comments. We are trying to keep old Willow comfortable. Readers, please visit Becky Ross Michael at Platform Number 4, an author’s blog. She writes both fiction and non-fiction. Dear Nia, it is always good to see you! Thank you for stopping by from A Cup of Tea With Nia and for the kinds comments. Old Willow feels a bit better tonight, but she will need the subcutaneous fluids from here on. She is eating again now, and talking. No, not easy days for her, or for me. Perhaps because I have end term kidney failure myself, I am especially sad to know Willow is suffering her own kidney issues. I can improve my circumstances with the excellent care of the local hospital’s dialysis unit, where three times weekly the efficient German dialysis machines sort out the bad from the good in my blood. That same care is unavailable for our animal friends, so it is bittersweet to know poor Willow must suffer a slow poisoning of her system as her kidneys shut down. Hugs and cuddles, poor kitty. I know what you feel. It is always good to see you Doug, and cats Dougy and Andy, my favorite Persian brothers! Thanks for stopping by from weggieboy’s blog -surviving retirement with two cats, and thank you for your kind support of old Willow. Yes, you would definitely know how she feels. Willow is feeling better with the subcutaneous fluids now, although she does not like the procedure much and gets more fidgety and cantankerous as she improves. She has lost muscle mass this year, but at least she is eating again, keeping her food and medicine down, and “talking”, and her diarrhea has cleared up. Urine goes right through her at this a point, and I do laundry for her twice a day, washing her towels she rests on. Her kidneys can’t concentrate urine anymore; that started earlier this year, as well as the frequency of UTIs. She is still bright and alert, always watching what I am doing. I am grateful for the time left with her. Always good to see you, Derrick! Thanks for stopping by from your blog site DerrickJKnight and for the kind comments. My old aunt that passed away was a favorite. She had an incredible spirit and sense of humor. She’ll be missed. Willow is feeling better with the subcutaneous fluids now. She has lost muscle mass this year, but at least she is eating again, keeping her food and medicine down, and “talking”, and her diarrhea has cleared up. Urine goes right through her at this a point, and I do laundry for her twice a day, washing her towels she rests on. She is still bright and alert, always watching what I am doing. I am grateful for the time left with her. That’s a dramatic image you led off with, and later you included a couple of particularly poetic descriptive prose passages. it’s good to hear that your appearance at the Spokane Fall Folk Festival was gratifying to you. Happy last month of the year. Always good to see you, Steve! Thank you for stopping by from Portraits of Wildflowers, and for the kind comments. Your are a first-rate photographer, and I am gratified you liked that image. Nature serves up some good ones! We had a freezing night a couple of weeks ago but the temperature today reached 70° with a clear blue sky. We went out looking for and finding some colorful fall foliage that the strong breeze hadn’t managed to blow down. Imagine that at the beginning of December. Colorful fall foliage in December is a nice find. I am waiting for it to drop into the 20s up here and stay there for a week, as sometimes does after a warm extended autumn. I am hoping that does not happen this year, as I am behind with winterizing and maintenance. It’s seems so like you, Lavinia–going through some very rough patches but still focused on the beauty of the world and being kind and supportive of all of us. 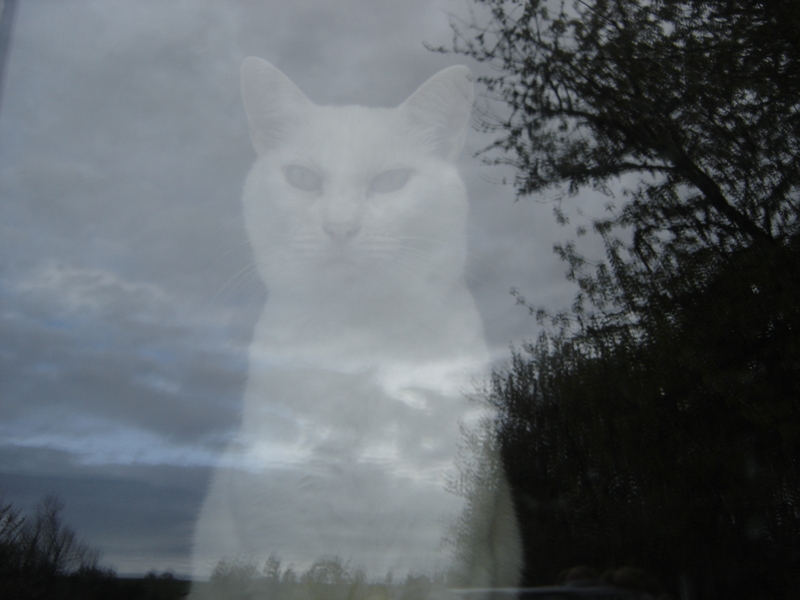 I have two CRF cats–they are in better shape, for the moment, than poor Willow but I dread what comes. It was nice to see the photo of you performing–would love to be able to hear you sing in person! It is always good to see you, Kerry! Thank you for stopping by from Love Those Hands at Home, and thank you so much for the kind comments. Old Willow is the second elderly CRF cat I have tended, and it is proving to be a roller coaster ride again. The subcutaneous fluids buy them some time, and comfort. She is eating and drinking again, and keeping it down. She does get supplemented with potassium, B vitamins and extra taurine. She is not the most cooperative cat with the sub-q fluids (the other cat was far easier), but I think with this last round she is getting more used to it. At some point she will run out of road. All the best with your two CRF kitties. They can go on for a number of years with good care. Willow has fought kidney and urinary issues for the last 6 1/2 years. She was very sick when she first came to us, recovered somewhat, but has been slowly going down over the last 3 years. I am glad that you got good sound engineers for your performance. They can make or break a session. Always good to have visitors from Scotland! Thank you for stopping by from Tootlepedal’s Blog – A look at life in the borders. I was indeed fortunate in the sound crew for the room and stage where I was scheduled. It was a good trip all around. 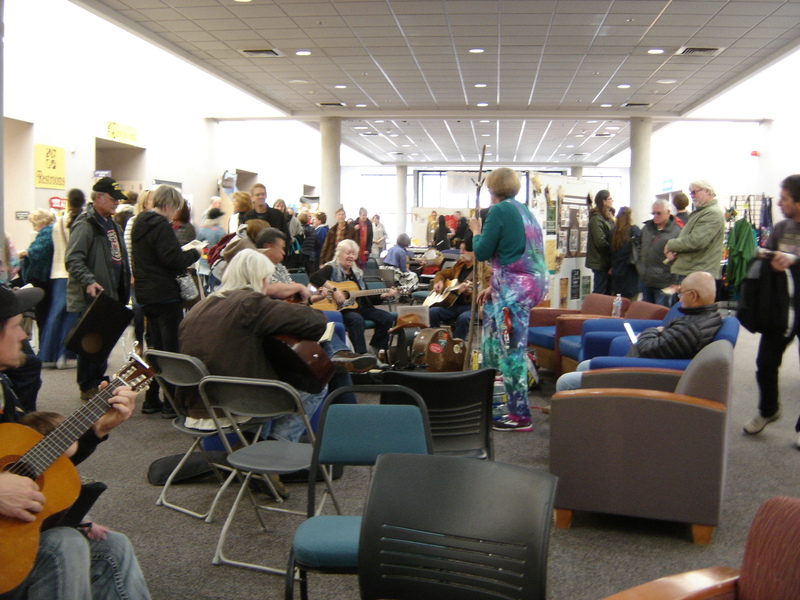 The Spokane community comes out in droves for this event, and the music spills into the hallways with people who have also come to jam with others. Our neighbouring village of Newcastleton has a traditional music festival that sounds just like that. Beautiful sky and cloudscapes Lavinia and spectacular scenes from the farm as always. I’m sorry to hear about poor Willow and wish her well. Your descriptions of the cycles of life were very moving. Always good to see you, Andrea! Thank you for stopping by from Harvesting Hecate – Thoughts on life, writing, creativity and magic. I am glad you enjoy these posts. Our cats are family to us. 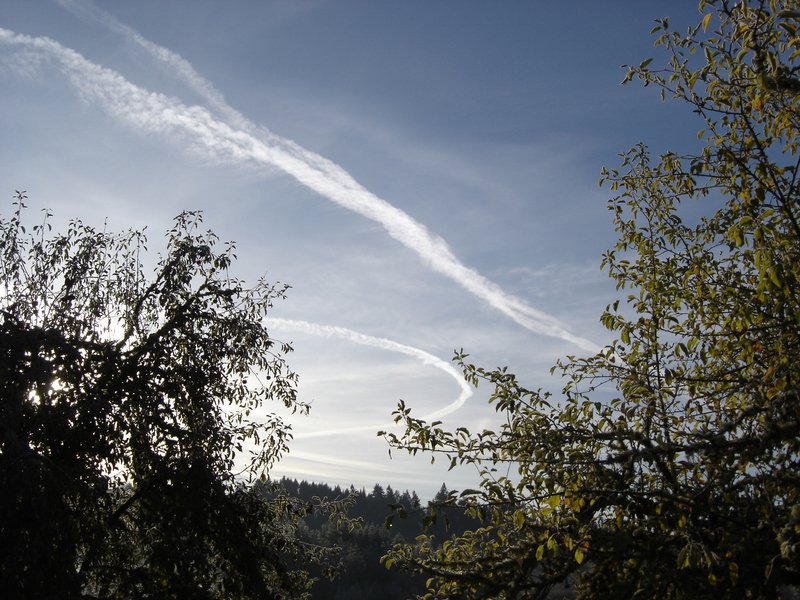 Barring fatal accident or disease for the human, their life cycles are much shorter than our own. It never gets any easier watching them grow old. Willow has had a good long run, and we will keep her as comfortable as we can. She is still interested in things and seems to enjoy her life. Cats with chronic renal failure can go on for long while if supplemented with subcutaneous fluids, so we will see how this all goes. She is the second elderly CRF cat I have tended. I understand Lavinia, we once had 5 cats and had to say goodbye to them all. I am sorry. It never gets any easier. As usual, a great post and wonderful photographs. Wonderful post and the photos are fabulous. Nature certainly gives us the best painting. 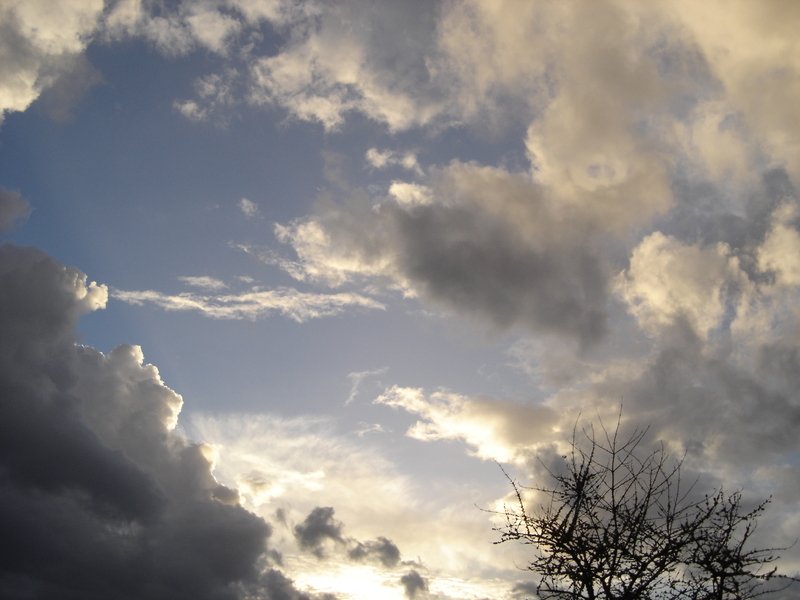 We are also having a fantastic cloudscape here lately and I’m always rushing to get my camera and take a photo. I’m so sorry for you loss. Always good to see you, Rosalinda! Thank you for stopping by from Subli – All about the Philippines – its history, its culture, and its people, and thank you for the kind comments. I am glad you enjoy these posts. I bet you do get some fantastic cloudscapes where you are! I’m sure you are eager to drink the rise when it is ready. It sounds wonderful. All the kitties are so beautiful. I enjoyed hearing from Lucky. Although I’m sad that Willow is not doing well. I finally had more than I can stand of my situation here — ready to take the big leap! I’m in the process of getting a cottage in NM. Wish me luck! Great big hug. Always good to see you, Teagan! Thank you for stopping by from Teagan’s Books, and for the kind comments. Old Willow and the kitties send their best to you and Crystal, too. I am glad to hear you are coming out this way! Big hugs back. There is a news magazine I highly recommend that covers issues in the west, High Country News I think you will find it an interesting publication. Readers, please visit author Teagan at her blog site, Teagan’s Books. She is a very creative and talented writer. You’re so kind to give me a shout-out. Thanks for the newspaper recommendation. Back to work now. Mega hugs! Delighted to hear the festival went so well. The rosé has a great colour — oh for the chance to taste it! Please give Willow a very gently hug from us. Sounds like you’ve many wonderful times together. We will give old Willow a gentle hug. The lactated Ringer’s buys some time, and keeps her comfortable. She is a venerable old lady cat. Hi Lavinia! So sorry to read about old Willow… Thank goodness you’re taking good care of her. Thank you for keeping us up to date. We always enjoy your posts, my friend. Hope you’re having a wonderful day. Mr. Bowie says “Meow!” and sends his regards! Always good to see you, Herman, and Mr. Bowie! Thank you for stopping by from Hands On Bowie, and for the kind comments. Old Willow sends her regards to you both. Cats and crew wish Mr. Bowie a successful checkup at the veterinarian, and hope he does not need medication. Mr. Nano says he hopes it is only “white coat” hypertension. Love the spider and sky pics! Always good to see you, Jeanne! Thank you for stopping by from Still A Dreamer, and thank you for the kind comments. We try to keep old Willow as comfortable as we can. I am glad to meet another Poldark fan, and that you got to meet Aunt Agatha. Rick and I saw an episode at a friend’s house a year ago, and we ended up renting the DVDs. It’s a great series! I haven’t seen any Downton Abbey yet, although I think sometimes we should create our own series and call it Downton Tabby. I had a great time in Spokane. That is a wonderful festival! Readers, please visit Jeanne’s blog at Still A Dreamer, as well as her shop on Etsy. She is a wonderful artist and graphics designer. It is always good to see you, Michel! Thank you for stopping by from France, and your lovely home and gardens! And very happy birthday wish for dear Janine! Thank you so much for the kind comments. I am glad you enjoy these posts. It is indeed a blessed place here. Rick was testing the two different batches of wine I made. Both were for him. 🙂 Wish we could share the wine with you! What a poignant post! Brought tears to my eyes as I thought of our old dog buddy Liam who brought such life to our home. You certainly live in a place of beauty. Always good to see you, Laurie! Thank you for stopping by from Notes from the Hinterlands, for for the kind comments! Friends for a short time, remembered for a lifetime, our animal companions. I remember your posts on your dog Liam, and I felt for you when it was his time to go. It never gets any easier. I am watching the sun rise. It peeked over the eastern ridge at 8:06 AM, spilling its golden light across a frosty 24 degree landscape. It will warm into the lower to mid 40s here today. Each day is unique, full of promise. Readers, Laurie Graves is a published author residing in Maine. Please visit her blogsite Notes from the Hinterlands for an enjoyable read on life in the hinterlands of Maine, and how to purchase her books. Books make wonderful presents! A-w-w-w, thanks, Lavinia! So generous! Always good to see you, Julie! Thank you for stopping by from Frog Pond Farm in New Zealand, and thank you for the kind comments. It is hard watching our animal companions age. Willow is holding her own, doing the best she can. Lucky is lucky to have a home with our friends M & J in Sicily. They rescued him off the street there. Oh, what a beautiful post. Thanks for sharing the lovely autumn colours at your farm, and for describing for us (via Lucky and local feline correspondents) what it looks and feels like at nightfall and in the mornings. Two points to note: wish I were nearby to see you perform at the festival. And I had no idea persimmon grows where you are. And what a huge tree! Always good to see you, Cynthia! Thank you for stopping by from Canada, and thank you for the kind comments! Our local Oregon and Sicilian feline correspondents send their heartfelt thanks, too. They enjoy writing about what they see happening on their respective farms. I would love to travel to Canada someday to play music. Perhaps down the road that will be possible! That persimmon tree was planted by the former owners parents, and is quite a beauty. We have a female (the big one you see in the photo) and a male tree. 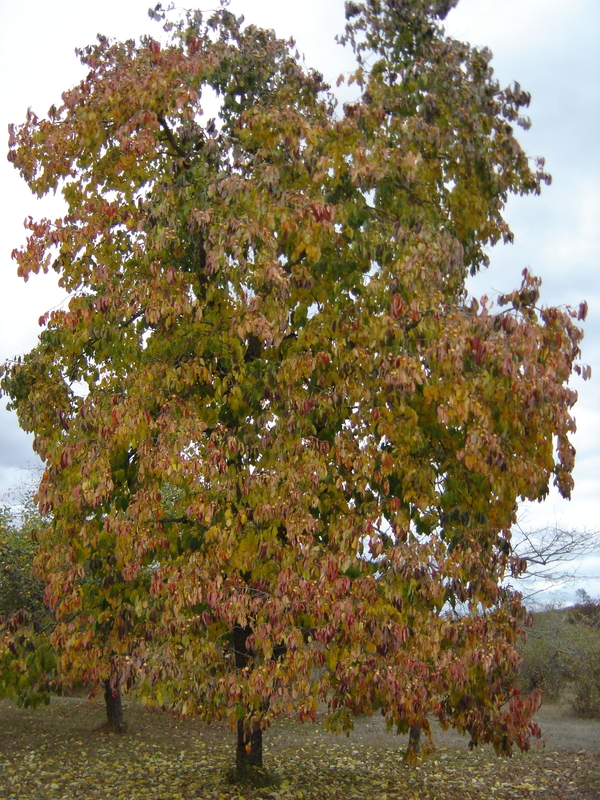 This species needs a male tree nearby to set fruit. From what I can tell it is of the hachiya type, needing a good frost and the onset of cooler weather to change color and ripen properly. The fruit is quite astringent prior to that. Readers, Cynthia Reyes is a fellow blogger and published author of note, a former journalist, producer-director and executive producer with the Canadian Broadcasting Corporation. Please visit her web site for more information on Cynthia and her work. She is the author of A Good Home, An Honest House and Myrtle the Purple Turtle, a book for children of all ages that teaches tolerance, understanding, and acceptance of who we are through the story of Myrtle and her friends. Myrtle now has a sequel, Myrtle’s Game. Books make wonderful gifts, not only for friends and loved ones, but for your local library, too! We’re sharing at least one experience just now. My Christmas cactus has begun budding out, too, and for once in its lovely life, I believe it may bloom at Christmas rather than Thanksgiving or Easter. I started it from a few pieces sometime before 1990. Eventually it grew too large to handle after multiple repottings, and its roots were decomposing, so I essentially started over, and it’s clearly happy. I’m sorry to hear that Willow’s not doing as well as our cacti. The Maori prayer is lovely, and I think very beautifully captures the slowing of the wheel of life that comes to us all. I have a dear aunt who is slowing more every month, but as she says, at 93, she’s entitled. I’m sorry for the loss of your beloved family member, but as my aunt likes to point out, it’s an experience that comes to us more often as we age. 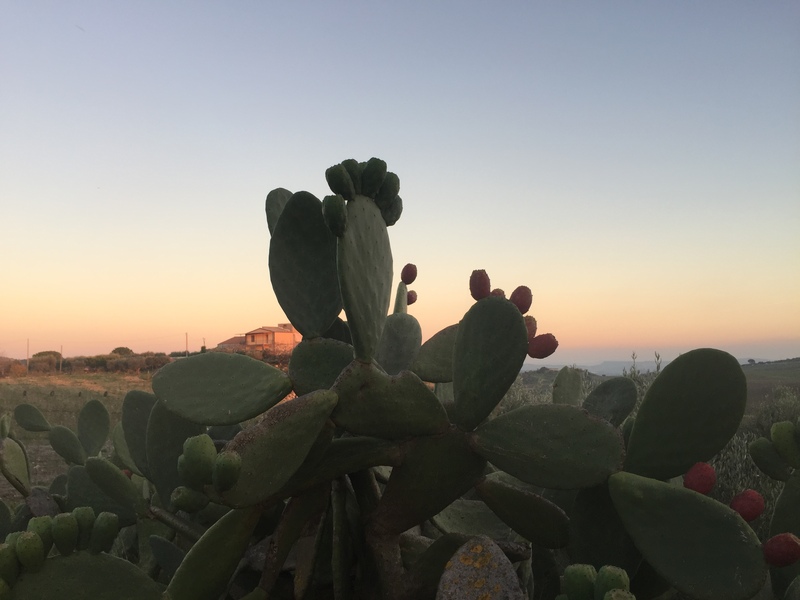 I did enjoy the report from Sicily, and was quite surprised to see the prickly pear. Every now and again I’ll see a plant with blooms and fruit both, and it’s always a fun sight. Our berries are beginning to ripen now, and because of this year’s rains, they seem to be more prolific than usual. I hope time slows a bit for you now, and that the days — and nights — are as peaceful as the images and descriptions you offer to us. Always good to see you, Linda! Thank you for stopping by from The Task at Hand and Lagniappe, and for the kind comments. That slowing of the wheel of life that comes to us all can be quite sobering at times, especially when I think about the line getting shorter. 🙂 Yes, I have lost a number of friends as well in the past few years. I’ve been through cancer and survived it, after being told I would die. I didn’t, and here it is eight years later. We all come with an expiration date, not readable by the normal man. Every day when I get up, I tell myself I need to be the best person I can be that day. I will think you when I look at my Christmas cacti in bloom. I am glad I have come to know you through your blog sites. You are a wonderful writer and photographer! May life be little slower and more peaceful for all of us this season. We will drink a toast to your little Dixie Rose cat in her memory. I think of her too, and what she meant to you. Superb cloudscapes! Good to hear that the wine is going well. Sorry to hear about Willow. That’s the trouble with cats – first they make themselves part of your life then they leave it. Old Willow is doing better on the subcutaneous lactated Ringer’s solution, although she is not fond of the procedure. It buys comfort and time for her. Thank you, have a good Christmas. I hope Willow remains comfortable. Thank you, Quercus. Here is another photo of her from her younger days. I know that feeling. I am also too old for nonsense and only want to be left in peace by the fire. I am glad to see that Willow is still with you but sorry she is so unwell. One of my cats suffered in the same way so I do understand what you are going through. Your photographs are so lovely! Like Kerry, I admire your ability to see the beauty around you despite having a tough time at present. I am sorry you have lost a dear aunt; my prayers are with you. It is always good to see you, Clare! Thanks for stopping by from A Suffolk Lane ~ A diary of my life in rural north Suffolk., and thank you so much for the kind comments. Old Willow is doing better on the subcutaneous lactated Ringer’s; it has bought her some comfort, and time. I miss my old aunt very much. Thank you so much for the thoughts and prayers! It is the beauty and goodwill around us that sustains us all in harder times. The sunset cloudscape is a beauty! Much admiring your persimmon tree too!